Anyway, I'm starting to get overwhelmed with all that has been going on, and frankly the past week has been stressful with present buying, cookie making, and planning for Christmas. I think the kids can feel it too. Friday was especially bad. 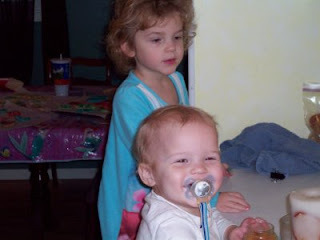 Liam was ridiculously cranky and Rori was whiny. I knew it was a bad sign when I asked her if she was going to be whiny all day and she said, "no, just for the morning time." At least she was honest. Liam cried off and on all day and by the time Bill got home we determined he had an ear infection. We called the doctor for a prescription and then had to rush to get ready for my company Christmas party. I felt bad leaving Liam but he went to bed at 5 and didn't get up til 6 the next day--so he didn't even miss us. Saturday Rori and I made cutout cookies. I was worried that I'd be too crabby from the day before, but we had a great time. 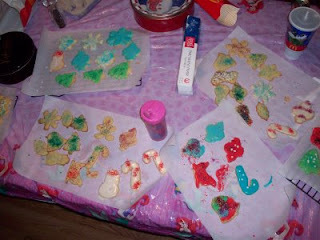 She went through about half of my sprinkles putting them on the cookies, but they look great. I thanked her for being such my good helper and she said, "thank you for being my momma." I melted on the spot. She's a baker in training! Liam wanted to get in on the action! It's scary, but everytime he sees you at the counter he has figured out to drag his chair over and stand on it and "help" you. I'd be more comfortable if he wasn't accident prone! Aren't they gorgeous :) They're quite tasty too! I really want to focus on doing things like this with my kids, especially during this season. I want them to find it magical. I love seeing the Christmas lights through their eyes, when they get so excited as we're driving around at night. 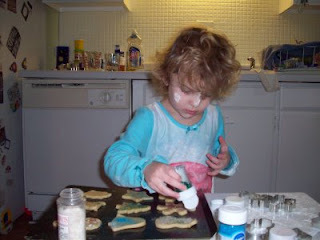 I want to be patient while we do things like make cookies, and not worry about the mess. But most of all, I want to focus on telling them about Jesus, and how He came as a baby so that He could save us all. PS We found out today that my sister is going to have a baby girl! I am so excited that she is going to get to find out about the fun of raising a boy and a girl! I am going to have to buy my neice her first disney princess! i want some cookies! and your neice wants a belle disney princess or mulan.